We call them shooting stars, and they never fail to make us catch our breath in surprise and wonder. But they’re not stars at all. 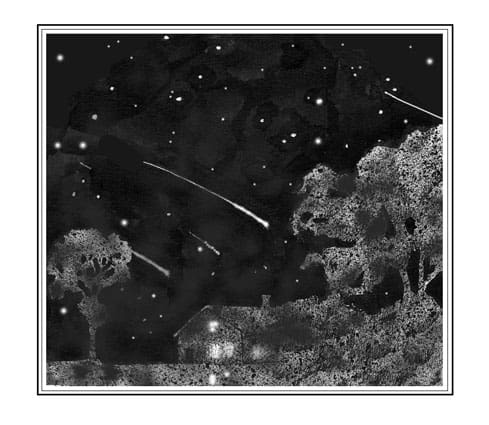 Those bright, brief streaks across the night sky are meteors. Clear skies permitting, the next few months bring three excellent chances to see batches of them. Meteors are debris left by disintegrating comets. Comets are mostly rock and ice, and once they enter the inner solar system, their orbits may bring them close enough to the sun to heat up, causing the ice to melt and vaporize. Particles of rock fall away from the nucleus of the comet when this happens. When the earth collides with the trail of this debris, the particles burn up in our atmosphere. One of the best things about meteor viewing is that all you need is a clear night and a chair or blanket. In fact, binoculars and telescopes are a hindrance, as they restrict your field of view. Celestial expertise is also not a requirement. The Orionid, Draconid, and Leonid meteor showers, named for the constellations Orion, Draco, and Leo, take center stage from October into November. The Draconid shower peaked on Oct. 7-9 this year and was best viewed between sunset and nightfall, which makes it notable. Moonlight can foil meteor watching plans, but a new moon on Oct. 13 made for good conditions. Most meteor displays are best after midnight. The Orionid shower, resulting from Halley’s Comet, is active Oct. 4-Nov. 14, and peaks on Oct. 21-22. The best viewing is from midnight to dawn, when you may see up to 20 flashes per hour. In some years, the Orionids have produced 50 to 75 meteors per hour. Meteors in this shower often have persistent “tails,” and some may be exceptionally bright. The Leonid shower peaks Nov. 17-18, and the best viewing will be pre-dawn. The crescent moon will set in the evening, leaving the sky dark enough to see 15 to 20 meteors an hour. Leonids are often very bright with long tails. Although each meteor shower streams from a particular area of the sky, known as its radiant point, that does not mean you need to look in its direction. Look directly overhead, advised Fairbanks Museum and Planetarium educator Bobby Farlice-Rubio, since that is where they are closest to the observer and will appear brightest. Chances are good that you live within a couple of hours of an astronomical observatory. New Hampshire and Vermont each have two, and they host public events and star parties. The Northern Skies Observatory in Peacham, Vt., hosts a free star party on Friday, Oct. 16. Staff members are excellent resources. There are also websites that offer valuable information for amateur astronomers. Professor McGrath recommends space.com and stardate.org, while Farlice-Rubio likes spaceweather.com and skyandtelescope.com. The American Meteor Society is also a good guide for weather and space conditions. So stay up late, get yourself a blanket and a midnight snack, and head for some place very dark. And keep your fingers crossed.